(Bloomberg) -- President Donald Trump’s national security team is deeply divided over whether to let a small group of countries keep buying Iranian oil after a U.S. deadline on sanctions waivers expires in May. Now that fight is getting ugly. The division -- primarily between John Bolton’s National Security Council and Michael Pompeo’s State Department -- has led to rising frustration and flared tempers. It’s exposing fault lines over how the president’s most senior advisers approach the Iran issue, according to four people familiar with the debate who asked not to be identified discussing the internal deliberations. Above the fray, at least for now, is a president who must weigh competing priorities. While Trump wants to make good on his “maximum pressure” campaign against Iran and strong-arm it into meeting U.S. demands -- including ending its ballistic missile tests and support for Hezbollah -- there’s also concern that squeezing Tehran too much will lead to a spike in oil prices. That could raise gasoline costs for U.S. drivers as the 2020 election nears. Favoring a tougher tack, Bolton and his team point out that oil prices remain low -- about $59 a barrel as of Monday. Larry Kudlow, the president’s chief economic adviser, backed that view in a meeting Trump had Monday with Israeli Prime Minister Benjamin Netanyahu -- a longtime supporter of a hard line against Iran -- arguing that dropping the waivers wouldn’t affect oil prices, according to a person familiar with the comments. But that could change quickly depending on production moves by OPEC nations as well as the administration’s separate efforts to choke off Venezuelan oil sales in a bid to push President Nicolas Maduro from office. A spokesman for the White House National Security Council said agencies are coordinating closely to apply maximum pressure on Iran. A State Department official said the U.S. goal remains to get to zero Iranian oil exports as quickly as possible, adding that the secretary of state alone has the discretion to grant exemptions. Trump has until the first week of May to decide whether to issue new waivers to eight governments -- China, India, Japan, Turkey, Italy, Greece, South Korea and Taiwan -- that were allowed in November to keep buying Iranian oil without facing penalties. The current speculation is that the biggest buyers of Iranian crude, including China and India, will get waivers again. But Bolton and officials in the Energy Department argue that it’s time for the administration to make good on its demands to push Iran’s oil exports to zero. Pompeo’s team, led by Iran special representative Brian Hook, caution that a sudden removal of Iranian crude from the market -- about 1.1 million barrels a day -- would fuel volatility and lead to a price spike. A key analyst who has advised the White House on its approach said the intensifying squabble underscores just how much more politicized the debate over the waivers has become as the U.S. presidential election in 2020 grows nearer. 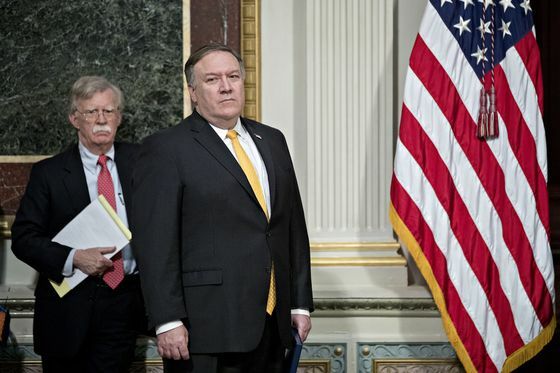 Pompeo, a hard-line conservative on most issues, and Treasury Secretary Steven Mnuchin find themselves increasingly isolated from Bolton and their usual allies on Capitol Hill, including Republican Senators Marco Rubio and Tom Cotton, who have argued for the U.S. not to grant any more waivers. According to two GOP aides familiar with the thinking of Senator James Risch, the chairman of the Senate Foreign Relations Committee, the Idaho Republican believes any new waiver will need “substantial justification” to be granted. Risch also thinks there’s more than enough oil sloshing around global markets to counter the crude removed from Iran, thanks to Saudi Arabia and the U.S., according to the people. As the debate plays out, Pompeo is also facing pressure from his own ambassadors. According to one of the people, Kay Bailey Hutchison, the U.S. ambassador to NATO, is among several who especially oppose giving Turkey another waiver. They argue that would send the wrong message when the U.S. is pushing NATO allies to cut ties with Tehran. The debate has moved along enough that Hook and his allies have lost several key supporters who were previously open to the waivers but now believe issuing them sends the wrong signal.